November 2004: the new map of North America. This is too obvious to be amusing, methinks. 07/03/2002: Bloody hell, not another US fubar! And no apology. And a veto against the International Court for justice against genocide usw. ZW News for stuff on Zimbabwe: feel lucky that you're not there. Painting by Monet of the Houses of Parliament, Westminster, London, UK. Burnt down, rebuilt twice, and the House of Commons chamber was rebuilt the same size, because it was good for business and excitement, said Winston Churchill, he the most venerated but imperfect elder statesman of the past century. Nowadays, it's the world according to the United States. Their world, and, indeed one should include the circumstances wherever the reader may live, has changed since September 11th., 2001, the day of the terrorist attacks on the World Trade Center, and the Pentagon. Unfortunately, what the USA generally believes is often a distortion of the facts, acerbated by a gross lack of knowledge of Islam. Woeful lack of knowledge, too, in Canada, where the relevant security department has not a single speaker of Arabic in its full complement of officers. The world of Islam has many facets: not all, by any stretch of the imagination are as radical as the Wahabbis and their ilk. Try this site: Secular Islam. Follow the Dr. Shaikh blasphemy insanity. Remember, most believers consider that Islam is not a peaceful religion: that we, the West, are members of the Dar al-Harb. We are supposed to be killed or converted. But, we may not have converted properly, and can still be punished. Circles within circles. Just like the Bible, a story or saga, made by man in the name of God. Not, never, by God. See the antiBigotry page re statements from the Koran on this subject. Note that recently, before this horror, the world according to America was Gary Condit; Canada's exports of timber; baseball; whether Jordan was returning to basketball; and why was Tiger not winning as much these days? 09/23/2001: The SAS are near Kabul? A four man team is in contact with resistance forces. Right! Meanwhile, the US response is a million times more in terms of ordinance, men, transports, aircraft carriers, ad infinitum. Nevertheless, Colin Powell has stated that this will not be like the Gulf War of eleven years ago. Hope not, if the effect of leaving the butcher of Baghdad intact was deemed a good result. And then there is something about a proliferation of depleted uranium littering Iraq, especially in the south of the country. September 2001: Please support the Red Cross, or any other disaster relief organisation, following the tragedies that occurred in the USA on September 11th. May we never forget the horrors of that and subsequent days, but let us not strike back blindly. There are uncounted innocents, everywhere. Remember, some of them are Afghani, and some of them are Iraqi, too. It's not just al-Qaida at fault. There is no need to destabilise Pakistan, using blunt force inappropriately. However, by all fair means mete out justice to the fearmongers and deluded zealots who dreamt up this evil. Steve Bell, The Guardian and, sometimes, The Economist: well, Osama bin Laden's acolytes have crept into the Western world, n'est-ce pas? A MESSAGE from the Queen, read by the British ambassador to Washington, Sir Christopher Meyer, drew tears yesterday, 20th September, 2001, at a service of remembrance in New York for the 250 British citizens still missing after last week's terrorist attacks. (This is the worst ever terrorist atrocity inflicted on British citizens: the final total is expected to exceed 300 people, ed). Her words were read to a congregation of almost 700, who packed St Thomas's Episcopal Church on Fifth Avenue, a soaring, neo-Gothic edifice in the heart of Manhattan. It included Tony and Cherie Blair, Bill and Hillary Clinton, as well as Rudolph Giuliani, the city's mayor, and Governor George Pataki. Kofi Annan, the United Nations Secretary-General, was also there. "Each and every one of us has been shocked and numbed by what we have witnessed in recent days. But none of us should doubt the resilience and determination of this great and much loved city and its people. Men and women from many nations, many faiths and many backgrounds were working together in downtown Manhattan when this unimaginable outrage overtook them all. "At your service today we think especially of the British victims. For some of them, New York was simply a stop-over on some busy travel schedule; for others it was a workplace of excitement and opportunity; for many it was a familiar and second home. These are dark and harrowing times for families and friends of those who are missing or who suffered in the attack, many of you here today. My thoughts and prayers are with you all now, and in the difficult days ahead. But nothing that can be said can begin to take away the anguish and the pain of these moments. Grief is the price we pay for love." Wait for it! 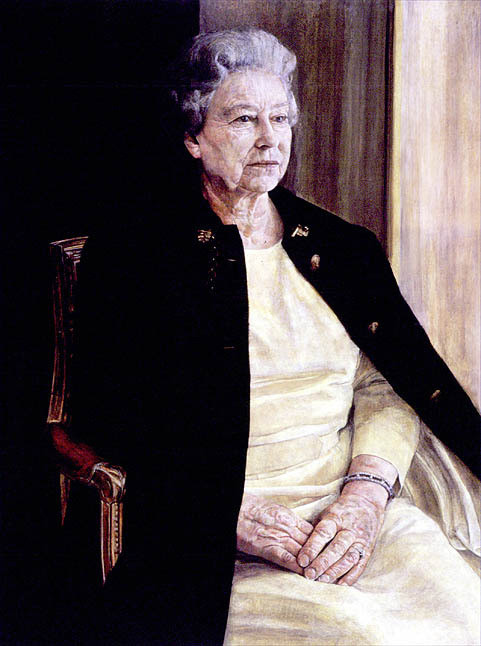 A disliked portrait of HRH Elizabeth Regina, contemporaneously 75 years old. A member of the Windsor family, allied to the Battenburgs, the Holsteins, the landed gentry of Europe. Not exactly, I would suggest, totally at ease with the likes of Ronnie Biggs, hein? (And, let Ronnie stew in gaol for what he has gleefully escaped for so many years. But, he died shortly after he returned to his roots. Poor soul, the anti-hero of the Great Train Robbery). Nevertheless, the address above that HRH had her representative make was masterful and very moving.